Info: Created on 6th December 2009 . Last edited on 8th December 2009.
very nice. a modular olde english. quite innovative. Awesome. I love the B and G. I think the H needs some work; it's a little hard to read for my eye. Congratulations! FontStruct Staff have deemed your FontStruction worthy of special mention. “Beagle” is now a Top Pick. Thanks for the Top Pick. still have to do the numerals! Nice fusion of sans and blackletter. Just can remember right away. @ anTyp this one was inspired by my other font South Central Swiss, i wanted to try applying the modular ornamentation and forms again but create something much closer to old english glyphs. i referred to lots of old english script fonts (i never would have done the UC 'h' that way otherwise) but subverted each glyph according to the same modular approach. i also love 'The Daily Telegraph' masthead! 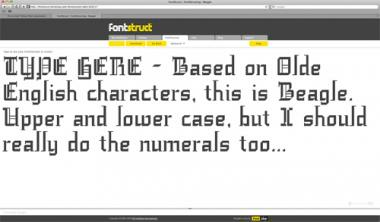 A great fusion font. I tend to agree with aphoria about the H.
Very nice. I really like this. Only things I'd suggest changing are the uppercase S, and Z, which both seem a little weak compared to all the other uppercase letters (not to mention that the UC S looks a bit like a $). What about making the thin decorative lines horizontal along the tops and bottoms? Or maybe keep them vertical but break the top and bottom by pushing the decorative lines into their respective apertures? Oh and of course numbers and basic punctuation would be nice. I really like this font and I would like to make figures for it, Cyrillic expansion and add some new blackletter calligraphic elements, as I already started. But if you opened the font for cloning, I would be grateful to you. In any case, I hope you do not mind that I intend to make the font better by indicating your original in the description.